If you just purchased a new iPhone Xs, setting it up from your old iPhone is quite easy. You only need to complete the normal Automatic Setup, and then transfer data from your previous iPhone to the new device. Doing this is quite easy and can be performed in a variety of ways. This article will give an in-depth analysis of the steps you need to take to set up your new iOS device from the old iPhone. 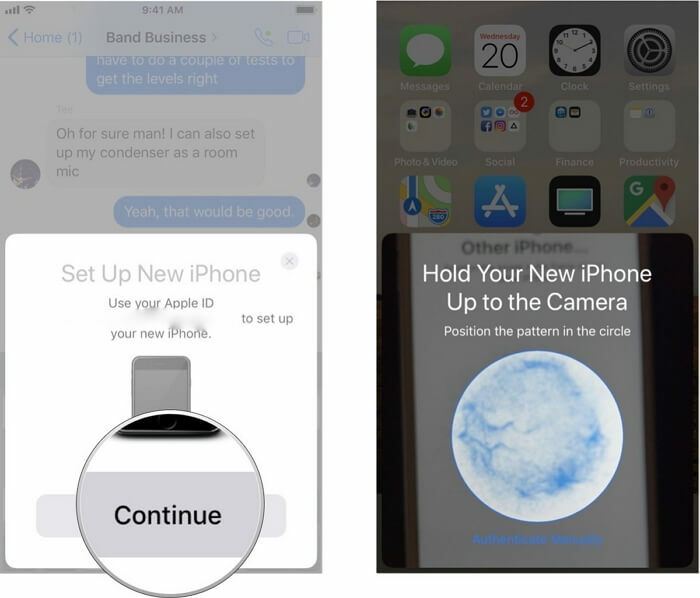 With your new iPhone, including iPhone Xs/Xr/Xs Max switched on, bring it closer to your old device, which should be running the latest iOS 12 or iOS 11. Doing this will automatically turn on the Quick Start screen. The Quick Start screen should provide you with the option to set up your new device using your existing Apple ID. Ensure it is the correct ID you would like to use and then choose Continue. An animation should appear on your new iPhone. Hold your older one over the new one, while ensuring you center the animation in the Viewfinder. At this point, you should get a message saying Finish on New Device. If you are unable to use your device's camera, just click on Authenticate and follow the prompts. When done with this, follow the provided instructions to set up Face ID or Touch ID on your latest iPhone. 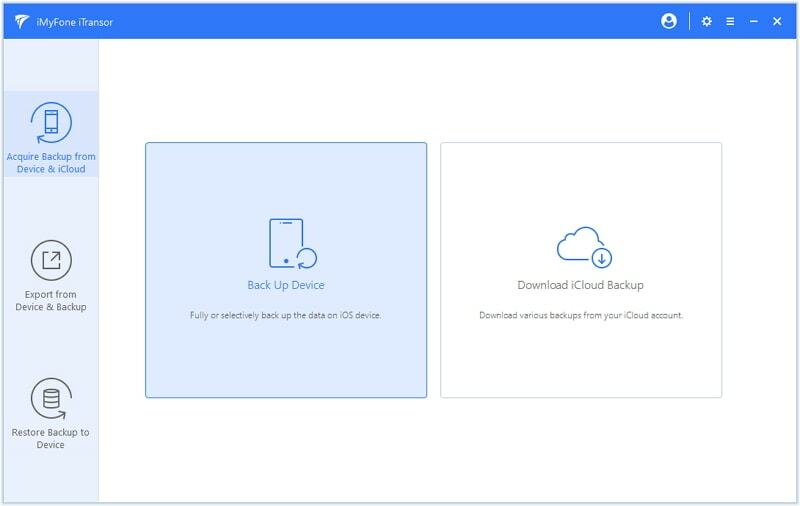 Your new device should provide you with a choice to restore applications, settings, and data from your iCloud's backup. 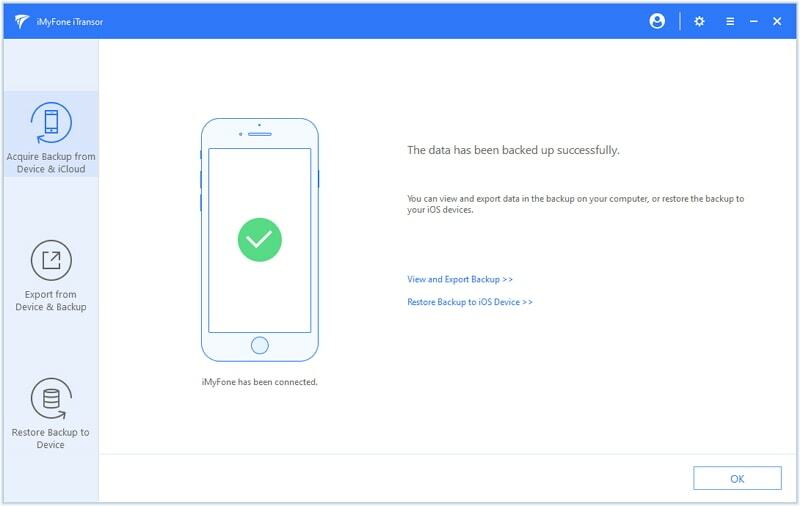 Simply select the backup you want to work with and restore the data on your new device. By completing these steps, you will have successfully set up your new iPhone from old iPhone backup using Quick Start. The problem with Quick Start is that you can only use it during the setup process. Due to this, it only installs basic features into your new iPhone from the old one unless you have an backup from old iPhone. If you want to transfer other data like contacts, and messages, then Quick Start is not the way to go for you. There is limitation on iOS versions, also. Quick Start can set up new iPhone from old iPhone provided that both of them running iOS 11 later. It works if you set up new iPhone Xs/Xr/Xs Max and iPhone X. but if you use iOS 10 and old versions on your device, then it cannot help. As aforementioned, Quick Start offers very little options to work with when it comes to setting up your new iPhone from old iPhone. This is why it is essential for you to consider another application, which give you more choices. Such a software is iMyFone iTransor. Selectively set up new iPhone from old iPhone. You can get all the data and settings, or only what you need from old iPhone. No limitation on iOS versions. Want to set up new iPhone running iOS 12 from old one running iOS 9? Done with the program. Supports all iOS devices, including iPhone Xs/Xr/Xs Max. How to Set Up New iPhone from Old iPhone via iTransor? Step 1. First download, install, and launch iMyFone iTransor on your computer. 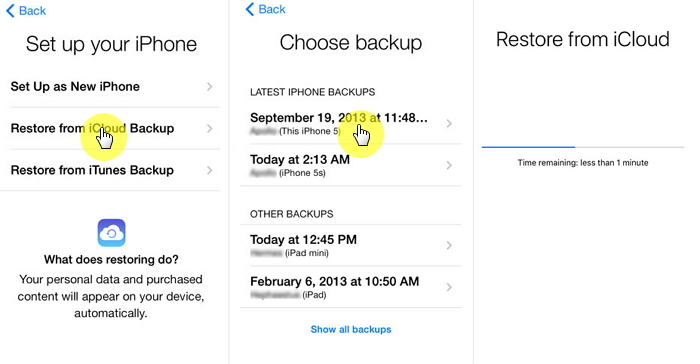 From the left panel of the app, select Acquire Backup from Device & iCloud, and then choose Back Up Device. Step 2. Connect your old iPhone and the application will recognize it. To continue, you will need to choose Make a Full Backup. Press on Back Up and the software will commence the backup process. Step 3. You will be notified after the backup is complete. Step 1. 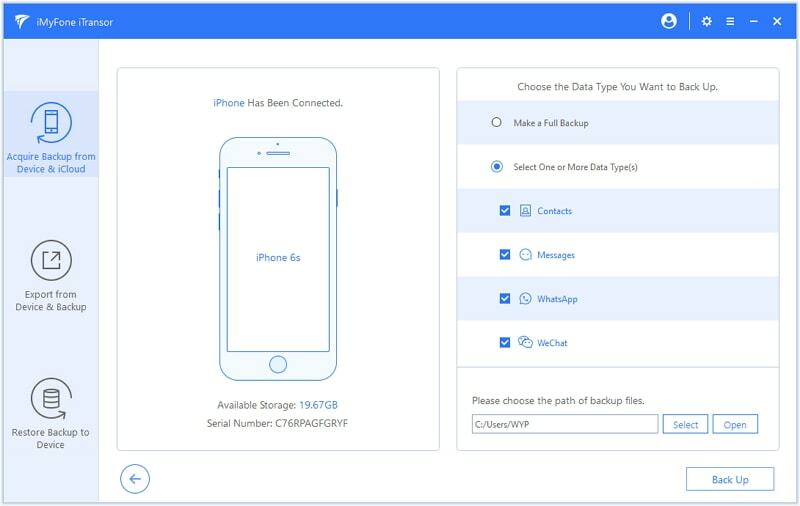 Launch iMyFone iTransor, connect your new iPhone and select Restore Backup to Device. Doing this should provide you with a list of all the backups you have made. Select the backup you just made and press Next. Step 2. To continue, you will have to select between Restore Partial Backup and Restore Full Backup. Choose your preferred option and follow the prompts to restore data into your new device. Step 3. The restore will take a little while and you will be notified after the process. Then you can enjoy the new iPhone. The great thing about iMyFone iTransor is that it allows you to transfer your desired data from your old iPhone to the new one. Therefore, if you only want to transfer WhatsApp, you can do so using iTransor. This is something that other methods are unable to offer, as they require you to transfer all data to finish the setup. iTransor has its own downside. It offers a free trial version for both Windows and Mac users, but you have to pay some amount of money to access certain special features. You can preview and select the data you want to transfer, but you will have to pay when restoring. 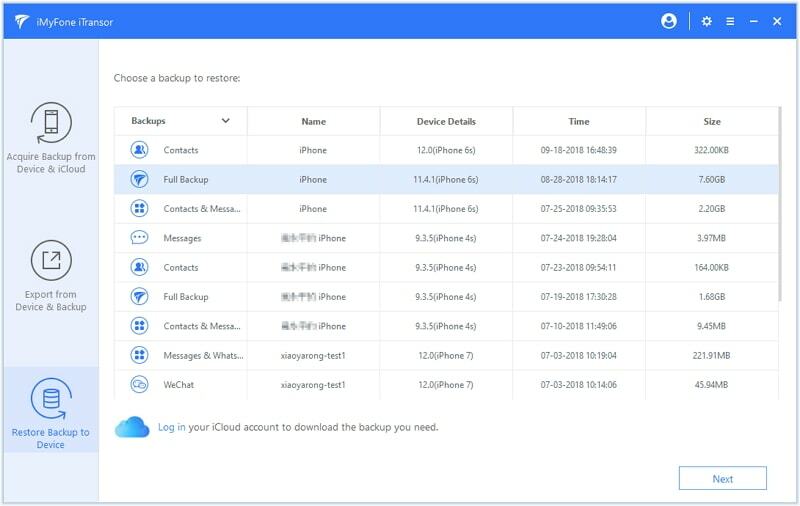 The first thing you will need to do is create an iCloud Backup for old iPhone. To do this, just go to Settings > iCloud, and turn on iCloud Backup. Then tap on Back Up Now. For this to work, you will need to stay connected to your Wi-Fi connection. To set up your new iPhone, start by turning on your new device. If you had already set it up, you need to reset it by going to Setting > General > Reset > Erase All Content and Settings. Then follow the prompts until you come across the Apps & Data screen. On this page, click on Restore from iCloud Backup and sign in to your iCloud account. 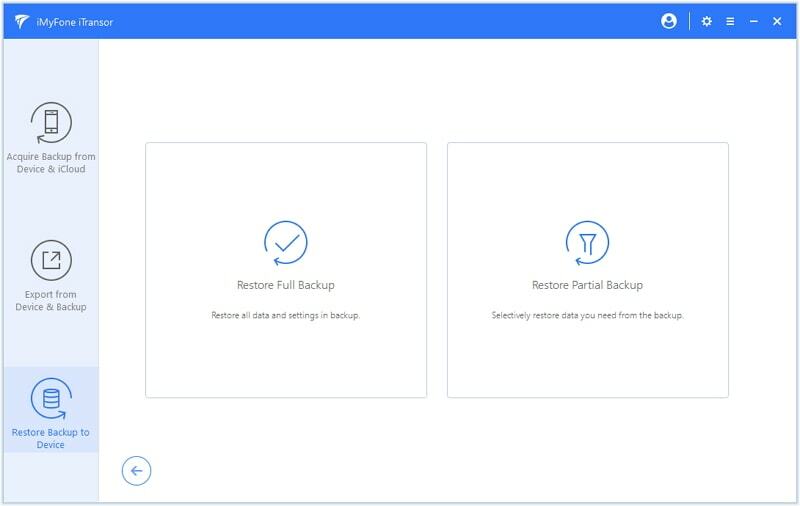 Select the Backup you want to restore and the setup process will automatically commence. Ensure you stay connected to the internet so that the setup process can complete successfully. iCloud is a good way to set up your new iPhone from the old one. However, this method has its own shortcomings, in that it cannot transfer certain data. In addition, it only offers 5GB of storage space, which definitely is not enough, especially for users dealing with large files. For individuals that want to transfer more than 5GB, they are required to purchase the extra space. The first thing you need to do is create an iTunes backup of your old iPhone. To do this, just connect your old iPhone to your personal computer, open iTunes, choose your device, and select Back Up Now. The backup should automatically start, and notify you when complete. 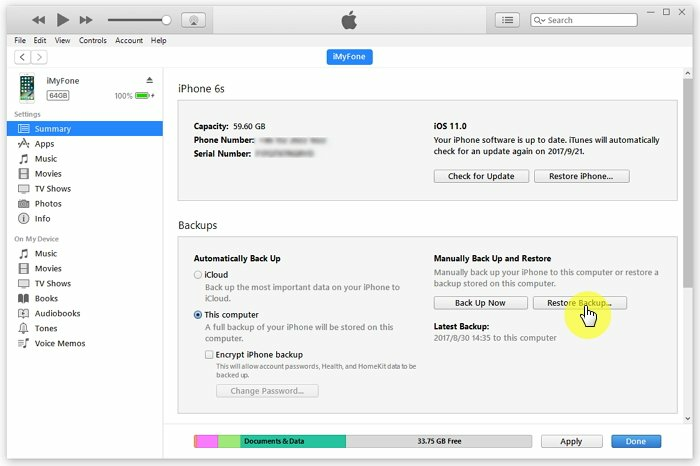 To transfer the iTunes backup to your new iPhone, start by turning it on and then following the prompts until you come across the Apps & Data screen. On this page, press Restore from iTunes Backup, and click Next to proceed. Afterward, connect your new iPhone to the computer with the backup. Launch iTunes, choose your device, and then click Restore Backup.... Choose your preferred backup to restore, and this will automatically commence the setup process. Be sure to keep your device connected to Wi-Fi to ensure the process completes successfully. The problem with using iTunes is that it does not allow you to transfer specific data. Therefore, if you want to transfer only one specific data type, you will have to consider iTransor. iTunes also goes wrong often during backup and restore, such as the Back Up Now button greys out and iTunes just cannot restore backup to new iPhone. It is good to back up your iPhone on a regular basis to avoid any issue that can cause loss of data. This is something that you can do using a tool like iTransor, which allows you to back up your data free of charge. The application supports to back up all the data, or only the data you need on device. Buying a new iPhone, especially the new iPhone Xs/Xr/Xs Max brings a lot of excitement, as the device provides you with the latest features. Nevertheless, you can end up feeling frustrated if you have no idea How to set up new iPhone from old iPhone. Luckily, with the aforementioned tips, you should be able to set up your new iPhone from the old one quite easily.